Aren’t you happy it’s Wednesday now? Last week I mentioned our exciting new collaboration with Horseneck Wines in Greenwich. Well for the next few weeks, we will be featuring a holiday related wine post every Wednesday. I think that makes the middle of the week so much more appealing! As it is now December and the party invitations are rolling in, I asked Terry Rogers, owner of Horseneck, to suggest a pair of wines, one white, one red, that would be lovely to bring as a gift for a special occasion. Terry’s pick for a white is the elegant 2008 Chalk Hill Estate Chardonnay ($34). 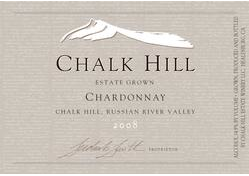 Although Chalk Hill is officially a Russian River Valley vineyard, its volcanic soils and unique terrain set it apart. Owner Fred Furth’s preference “to be the best, not the biggest” especially appeals to us. This is a full bodied chardonnay with a rich palate of tropical fruit which is balanced by the distinct minerality typical of this wine from the Estate. This wine can be enjoyed alone or alongside a wide variety of dishes including crab, scallops, fish and roasted chicken and is an excellent choice for dishes with rich butter or cream sauces. Terry’s pick for the red is the 2007 Bouchaine Pinot Noir ($25). 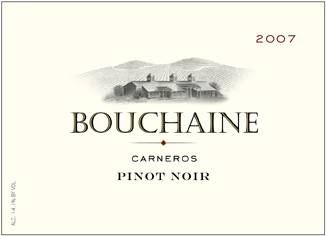 Bouchaine is the oldest continuously operated winery in the Carneros District of the Napa Valley. I loved Bouchaine winemaker Michael Richmond’s description of the differences between making Chardonnay and Pinot Noir. “Making Chardonnay is like raising kids back in the 50’s, with a lot of parental control and the expectation that the next generation will conform to that training. Making Pinot is the more ‘modern way’ of raising children, where the parents just set the boundaries and try to keep them out of jail. With Chardonnay, we hope to be delighted by and proud of the outcome of our supervision; with Pinot, we hope to be delighted and relieved by the way it turns out. It’s the difference between shaping the Chardonnay and allowing the Pinot to manifest itself. Pinot is one of the most precocious and capricious of all grape varieties.” It’s no accident that Pinot has recently become so popular. It is probably the most versatile red wine and pairs beautifully with many foods, making it the ideal gift. Bouchaine describes this pinot as “highlighting classic Carneros fruit: pomegranate, plum, and cherry fruit flavors, balanced by nuances of coffee and toffee.” Yum!! 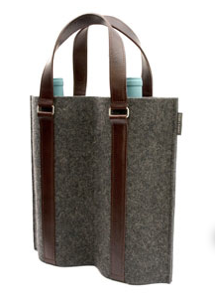 To round out the gift, the perfect addition would be a handsome Gräf and Lantz wine carrier. Gräf and Lantz is a Los Angeles based design studio whose goal is to create products that are luxurious, aware and functional – our kind of place! They primarily use high quality 100% merino wool felt which they produce and import from Germany. This felt is not only very durable and pill resistant but also lends a sculptural quality that inspires the structure and form of their designs. The natural oil content of the wool makes the felt stain and water resistant. If any spills occur you can just dab off the moisture with a wet towel or rinse lightly with water. Gotta love it! Best of all it is a natural, sustainable and biodegradable material. 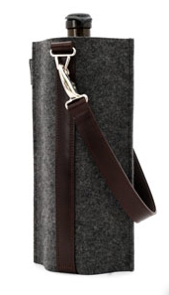 Their wine carriers are available through Horseneck in single ($78) or double ($118) versions in red or charcoal felt and vegetable tanned leather. They are both elegant and practical! Cheers!! This entry posted in food and drink, gifts, wine. Entry Tags: Gräf And Lantz, Horseneck Wines, Wine, Wine Gifts Bookmark the permalink. Michael’s description of making his Pinot is priceless – yes, setting boundaries and keeping our kids out of jail is definitely part of modern-day parenting… so is keeping Mom out of the wine cellar during the week! Love these ideas for holiday and hostess gift giving! Buzz – I thought so too! And I’ve seen the bags – they’re beautiful! What fun! I love finding new wines. Happy December! Hi Kate – me too! Always great to try something new. So thoughtful…wish we had the selection here! Hi Heather – but you have so many wonderful exotic things we don’t have! This is definitely fun! I love wine. I used to live in the Okanagan in Canada, where they make the best wines in Canada and I used to have fun going to so many wineries. So, I really enjoyed this post. Thank you! Hi Luciane – Oh that sounds like it was a great place to live! Will stop by later! Like the Buzz, I appreciated the Pinot description, funny. This is very helpful for me because I don’t drink much – maybe 2 glasses a year so I am clueless when trying to purchase wine. I never know what to bring to someone’s house or what to serve at my own. Sounds like Pinot would always be the safe choice – just saved me a lot of angst – thanks. ET – glad to help. Anything Terry recommends is worth trying! Loving this mid week virtual cocktail! We are giving a wine to our neighbors that bears the name of the street we all live on – thistle – and to boot, it’s delish! Well, for someone who has just been out to lunch with friends and drunk nearly a whole bottle of Sauvingon Blanc, this is the post for me !!!! I love a glass of wine be it red or white. Hi Jacqueline – Welcome! Lucky you – sounds like a great lunch. Cheers! We’re a wine consuming household so this post is right up our alley:-). My hubby is definitely an expert on wines too and would definitely appreciate those bags! Hi Stacey – The bags are great – to have or to give as gifts – very handsome! Hi – Nur ein bischen! Ich habe einige Sommer in der Schweiz verbracht! Thanks for stopping by. Hi Diana – So glad you liked the post – I’ll try and stop by soon! Hi Zhush – Yes, the totes are great ( i’d probably need the double as well!) – and I LOVE Chef Louis too – maybe I’ll see you there sometime! Love hanging out with you…not only can you pick my movies for me, but I also fancy your wine selections! Hi Jermaine – thanks! and we’ll be starting gift giving suggestions next! Hi Barbara – yes, the guys are impossible!! Isn’t that belt fabulous? Wish they made it for women!